Calculations at an arbelos. 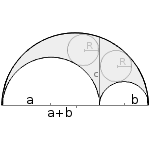 An arbelos is formed by three semicircles. Of those, the large semicircle has the same diameter (referring to the original circle) as the two small ones together. The small semicircles are laid plane on the same side of the baseline of the large one and then are subtracted from it. 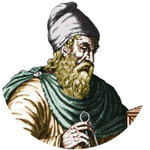 Two identical circles can be inscribed into the two unequal parts of the arbelos, those are called Archimedes' twin circles. Enter two radiuses and choose the number of decimal places. Then click Calculate. Radiuses, length and perimeter have a one-dimensional unit (e.g. meter), the area has this unit squared (e.g. square meter).